This stove board comes in a 48 inch by 36 inch size, and is made with an attractive woodgrain design. With this stove board, you can protect a large area in front of your hearth, or by adding a spacer kit, you can use it as a wall shield to protect your walls. No matter what type of heating appliance you use, this stove board can effectively prevent damage and improve the appearance and atmosphere around your fireplace. 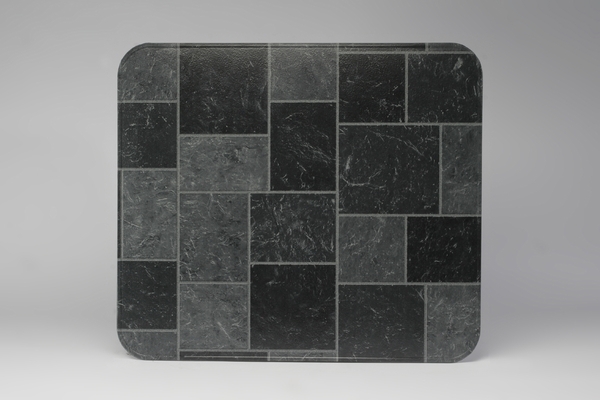 This board is rated to handle up to 200 pounds per square inch, per the manufacturer. Can a wood stove be placed on it? A wood stove can indeed be placed on this floor protector. How thick is this Hy-C 36 inch x 48 inch Type 2 UL1618 gray slate tile stove board? I assume it will necessitate cutting the flue pipe to accommodate this amount. These boards measure 5/8 of an inch thick. If there is not any additional wiggle room with your stovepipe slip connector, you may indeed have to reconfigure your stovepipe to make the run shorter. Is this real tile? How heavy is this? This item uses a steel casing that has a tile pattern printed on it. The entire board weighs approximately 25 pounds. This item is exactly what I needed for my pellet stove. Works great haven't had any problems. It arrived on time and damage free.